Three people were taken to hospital after a "small explosion" at a supermarket in Guernsey. Emergency services were called to the Co-op En Route store on Les Camps in St Martin at about 12:00 BST. A customer was understood to have been injured when he was hit by a ceiling tile and taken by ambulance to hospital. Two members of staff who were suffering from shock were also taken to hospital, a Co-op statement said. 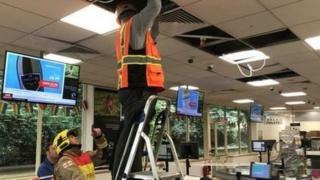 The statement added that ceiling tiles became dislodged above the checkout area following the "small explosion". It was caused by an air conditioning pipe being "fractured" during "routine maintenance".